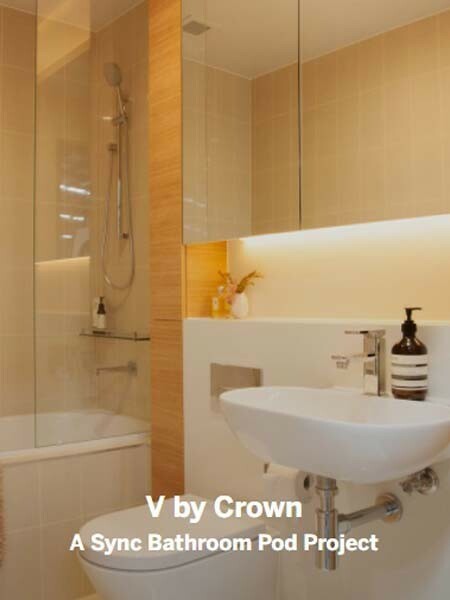 Hickory Group supplied 710 bathrooms to V by Crown, a landmark 29-storey luxury apartment project being developed by Crown Group in Parramatta, NSW. Sync by Hickory was subcontracted to deliver 710 bathroom pods for the luxury development in 10 different typologies to meet the varied design requirements of the mix of 519 one, two and three bedroom apartments, executive studios and exclusive penthouses. V by Crown is designed by Allen Jack + Cottier Architects with Koichi Takada Architects serving as the interior architect. All bathrooms feature ceramic floor and wall tiles, recessed mirror laminate wall cabinets, stone vanity tops, lavish bathroom accessories and LED lighting. Following the successful implementation at the Parramatta project, Sync was once again commissioned by Crown Group to supply an additional 88 bathroom pods for the Crown Ashfield project.